Support for floating bubbles in landscape mode. Issue: Floating bubbles hide sometimes behind the notch when minimizing windows. Please update documents viewer that can read PowerPoint (such as .pptx .ppt .pps .ppsx ), Excel (such as .xls .xlt .xlm) and Publisher (.pub .xps) files too. Currently, the only way to play a video file in landscape is to turn on the phone auto-rotation. It would be much more convenient if there was an option in the applet that rotated the video without the need to alter the phone settings. Note that I don't mean changing the phone settings using this feature. JUST ROTATE THE VIDEO IN THE VIDEO PLAYER ALONE AND ALONE AND ALONE. You can add it to the drop down menu or next to the full-screen button. WhatsApp from WhatsApp web using floating apps browser. I understand you cannot make an app for WhatsApp. However, what about using the WhatsApp web feature to window WhatsApp? I currently use WhatsApp web on the floating apps browser desktop version however, navigation is difficult due to the browser being too far zoomed in, making it almost impossible to see conversations and chats when the app is windowed but t isn't too bad when its maximised. Something like how kiwi browser or rocket browser does it. Chrome has an add-on called dark reader too. Basically, invert colors in webpages without inverting images or videos. Swipe gesture for video player to "seek"
This way is more convenient for "seeking" (i.e moving the video back and forth). Almost all video players have this feature. You can add an option for turning it on or off if you think some people might not like it. There is a similar idea already, but my point is to also make the customization of the trigger area width possible. I have a S9+ with curved screen edges and which makes it harder to open the menu. Probably as well because of an option that's ment to block unintended touch inputs, I guess especially at the edges which is useful in general. Also phone cases that go far around the egdes make it more difficult to open the menu quickly and conveniently. Same if the margin between skin and phone frame is very slim, your finger always hits the edge of the phone body before the edge of the screen and may miss the second one then. That the percentage of "Zoom" can be established when a WebApp is created. Giving a more realistic feel of native app. I use the floating menu with the corner swipe gesture a lot.. (Swipe right corner) but because it covers the whole right hand said of the screen, if there is a sidebar in an app that opens from the right, triggering it is very difficult. And I always trigger the floating menu instead. In an earlier version before the redesign (a year or two ago) a certain area of the screen's corner was allotted to the floating menu and I could use the part about or below it to trigger other apps side bar/menu functions without the floating menu coming up.. Simple separator bars and perhaps some additional tools like naming categories. Give all apps a setting that allows us to chose global or specific applications. Upon doing so the these applications would appear either at all times or only when the specific application is the active. 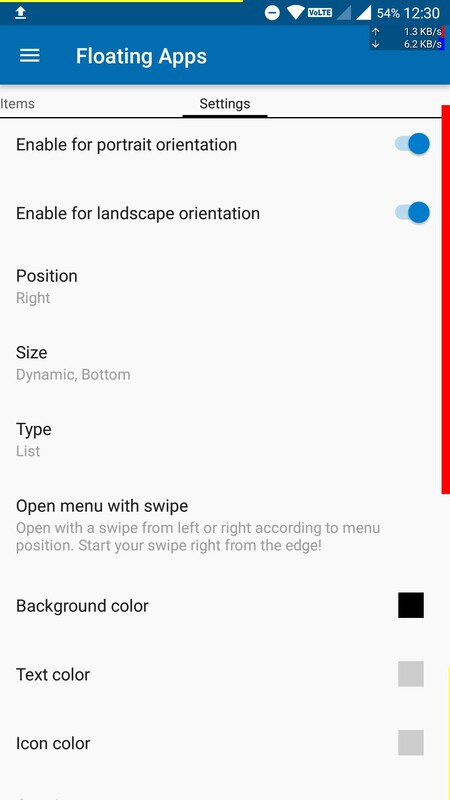 - It opens by swiping from the screen border towards the middle. -> To close it, swipe towards the screen border from somewhere on the Menu. It would be more intuitive than having to look for the "X" button on the menu or looking for an EMPTY area outside the Menu to tap. It makes it easier to close the menu when you opened it accidentally. Could be great to be able to read the whole video titles in the playlist in YouTube New. Some cool animation to add when opening floating menu.